Once Favorite Formats are set up in a 3Play Media project with Content Publishing enabled users have the ability to grab links to files in specific formats for the purposes of remote publishing and content sharing. Before getting Content Publishing must be enabled and a Favorite Format should be set. Follow the steps below to copy a publishing link to a 3Play Media file in a specific format. 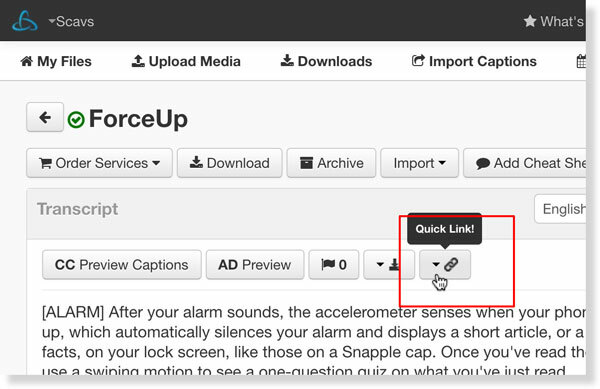 Click the Publishing Links icon located above the transcript preview window. NOTE: If Content Publishing is not enabled, the Publishing Links icon will not be displayed in your 3Play Media project. Once the Publishing Links icon is clicked, all closed captions and transcript formats that are set within your project as a Favorite Format will then display. Click the format you wish to retrieve a publishing link for. If you need a URL that points to this file in the format selected in step 3, the URL listed within the Publish Link window can be copied here and then used for remote publishing purposes. To view the file, click the URL and the file will open in the selected format within a new browser window. Once you have opened the publishing link in a browser window, the file can be downloaded by adding ?dl=1 to the the URL. Once ?dl=1 is added to the URL, click Enter/Return on your keyboard and the file will download to your computer. Once Enter/Return is clicked it will immediately save the file to your computer.